Parts of Queensland received record-breaking rainfall as Tropical Cyclone Trevor tracked over the state last month. 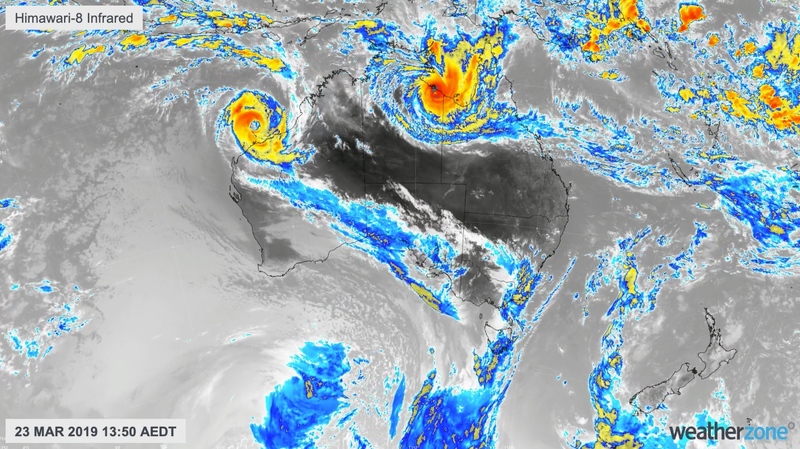 Cyclone Trevor crossed Cape York Peninsula during late-March, before moving over the Gulf of Carpentaria and then slowly drifting across the NT and Queensland. Image: Tropical Cyclone Trevor on March 23rd, shortly after making landfall. The slow movement of Trevor's remnants brought record-breaking rainfall to parts of central and western Queensland. Isisford (146.4mm), Peakvale Station (86mm), Springleigh (141.2mm), Talagai (169.2mm) and Albro Station (143mm) all registered their highest March daily totals on record. Data for these locations goes back between 30 and 130 years. Rainfall totals across some drought-weary areas of central and western Queensland were in the top 10 percent of historical records last month. Further north, parts of Cape York Peninsula had their wettest March on record thanks to the passage of Cyclone Trevor. Last month's wet weather followed record-breaking February rainfall in parts of northern Queensalnd, driven by another slow-moving tropical low and monsoon trough. Thanks to a combination of these two events, some areas in northern and western Queensland have already exceeded their average rainfall totals for 2019.